This plug uses an MPR084 to support up to 8 capacitive touch sensors. These can be created in any shape you like, using some conductive board, film, or tape. 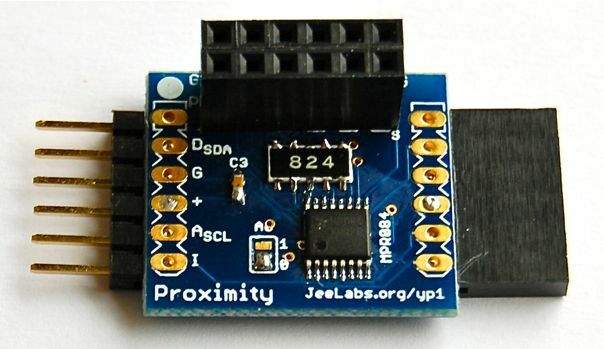 There’s a solder jumper to set one of two I2C addresses, so up to 16 sensors can be hooked up to a single port. Capacitive sensing can be fairly tricky to get right – the sensors may respond slightly differently, cross-talk between each sensor, electromagnetic noise pick-up, etc. But this chip does a lot of the work for us. There are many configurations settings, and I’ve only started to scratch the surface so far. The current setup is configured to only report a single touch at a time, and does auto-calibration on startup. I’m still seeing some cases where things lock up and may have to be reset (in software), so the interface class for this thing is very basic for now – simply giving acces to the individual registers from I2C. Note that the MPR084 chip wants a 100 KHz I2C bus. One thing I’d like to try with this thing, is to create some input buttons with it using the Carrier Board box. It would be nice if the sensors can be made sensitive enough to reliably work with a bit of copper on the inside of the box, then you wouldn’t even have to drill holes or make any cutouts to be able to control what’s inside. Otherwise, perhaps a slit for adhesive / conductive copper tape, covered up with plastic foil? Remember the simple parallel-plate capacitance formula, C = (dielectric const.) * Area / thickness. So you get twice the signal if you make the copper twice the area, OR if you make the distance between the copper and “ground” (your hand) half as big. There is a limit to the effective size increase if you want to see (for example) a finger touch- the size of your finger! So I think you’ll end up trying to get the absolute thinnest possible insulating barrier. A very thin plastic film, or just a PCB with a soldermask layer may be good things to try.